Buy this item and earn 1,615 ClubPoints. A professional grade KVMA switch delivering ultimate flexibility for users who wish to share high resolution (up to 5MP) multiple screens and modern USB peripherals between a multiplicity of computers. 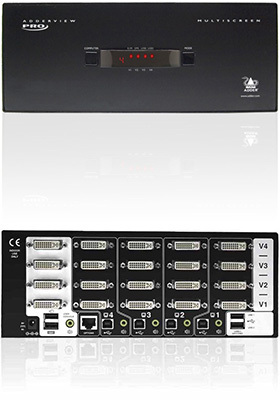 AdderView PRO MultiScreen is designed to enable four multihead computers to be controlled from a single high resolution KVM console using either dual link DVI or high definition analog video links. The switch makes use of Adder's True Emulation technology which enables USB HID devices to be continuously emulated to each computer. This unique technology enables instantaneous and reliable hotkey switching while also supporting the extra keys and features of enhanced keyboards and mice. Furthermore, the AdderView includes two independently switchable USB 2.0 channels and an audio channel, giving the user the flexibility to attach selected peripherals to different computers. AdderView PRO MultiScreen features Extended Display Identification Data (EDID) Emulation and advanced profile DDC ensuring that separate EDID data from each video display will be distributed through to the appropriate video adaptors within each computer. The extended DDC EDID profile ensures that the switched graphics card is always optimized to work with your screen. The KVM, speakers and two separate USB devices attached to the AdderView PRO units can either be switched in unison, as normal, or you can mix your peripherals between any of the systems to suit your current tasks. For instance, you could be creating emails on one system, listening to a soundtrack from another while a third is sending documents to your printer and a fourth performing another task with a different USB peripheral. The AdderView PRO MultiScreen features full dual link DVI video delivering 5 megapixel resolutions per head at 60Hz. Because the AdderView features DVI-I, you can also use a choice of digital or analog sources. The extended DDC EDID profile ensures that the switched graphics card is always optimized to work with your screen. The dual link DVI capabilities enable users to work at very high resolutions including 2K (2048 x 1080) on each head for post production or WQXGA (2560 x 1600) per head for detailed medical imaging. 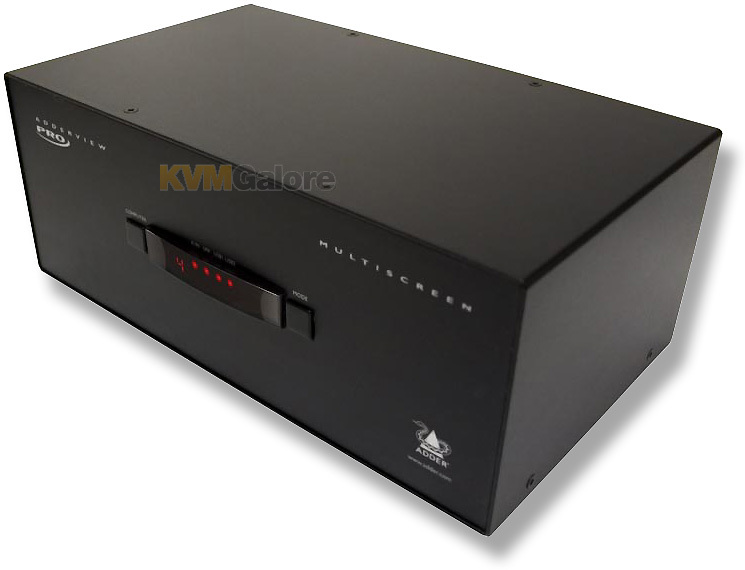 The AdderView PRO MultiScreen belongs to the first KVMA range of switches to feature Adder's advanced True USB Emulation technology. Emulated USB provides an instantaneous and reliable switching action and makes keyboard hotkey and mouse switching possible. Previous implementations have used generic emulations and consequently have only been able to support the most basic keyboard and mouse features. Adder's revolutionary True Emulation technology overcomes this frustrating limitation by emulating the true character of the connected devices to all the computers simultaneously. This means that you can now use the extra function keys, wheels, buttons and controls that are commonly found on modern keyboards and mice. With the AdderView PRO MultiScreen, a whole new group of users can take advantage of the flexibility KVM switches have to offer. Users in Architecture, Graphic Design, Post Production, Animation, Medical Imaging etc. often need to use specialized interface devices such as graphics tablets, 3D explorers, joysticks, and so on. The AdderView PRO MultiScreen makes all this possible. Flexibility is key to the AdderView Pro. The switch enables you to use the KVMA console to work on one computer while your USB peripherals are connected to other computers and your speakers are playing music from yet another. 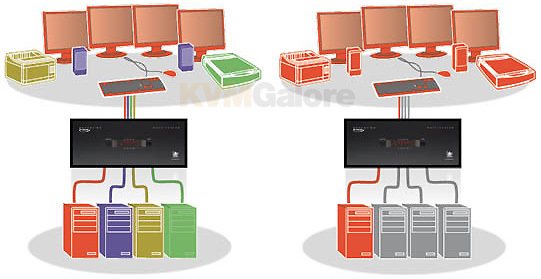 You can of course still switch all connected devices to any one of the connected computers as with any other KVM switch. The AdderView Pro can be switched using selectable keyboard hotkeys, 3 button mice or the front panel controls. Optionally, you can also use the RC4 remote switch to make your selection.These switching options allow you to rapidly reasign connected devices to any of the connected computers. A vast range of USB devices can be connected to the AdderView Pro, from non standard human interface devices to printers and scanners. This gives great flexibility. For example, you could be scanning a set of documents onto one computer while working on another and printing from yet another, all at the same time. The USB 2.0 switching action has been carefully engineered to ensure maximum computer reliability when connecting and disconnecting USB devices. An 'Options' port enables the AdderView PRO MultiScreen to be remotely switched using simple ASCII codes. When the channel is switched, the same ASCII codes are echoed to the 'Options' port. By linking 'Options' ports, two or more units can be switched in synchrony to switch more than 4 video heads. The port enables a 4 button switch unit (RC4) to be used with the AdderView Pro. The same port can also be used to upgrade the firmware to guarantee that your hardware investment continues to deliver real value well into the future. Listed below are additional products to consider which are compatible with AdderView 4 PRO DVI MultiScreen, Quad-Head. These items may be required to complete your system.